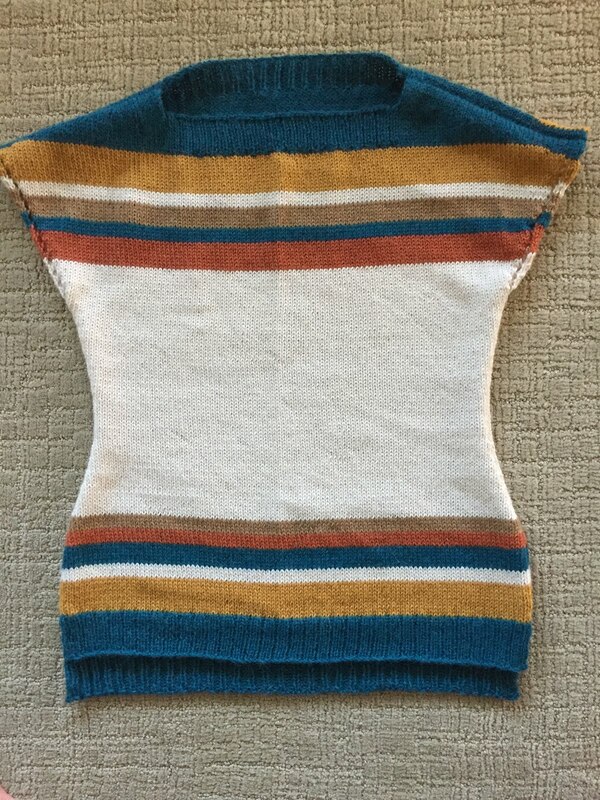 The huge advantage of a knitting machine is that it enables the knitter to produce large expanses of nice even stockinette stitch in no time. 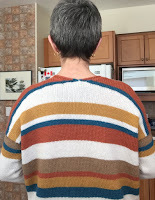 Most knitters (well, yours truly anyway) find knitting large expanses of stockinette a real bore. But it is a really wonderful fabric and I want more of it in my life. So ... on to the machine. Start to finish, the cardigan was done within ten days, and that included some time spent swatching to figure out how to knit the edges so they wouldn't roll too much, a day spent learning to use my new linker, and a day of weaving in the MANY ends. Because stripes. 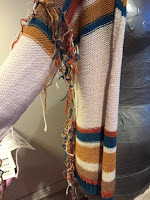 (The next time I knit anything striped I will weave those ends in as I knit. Lesson learned.) 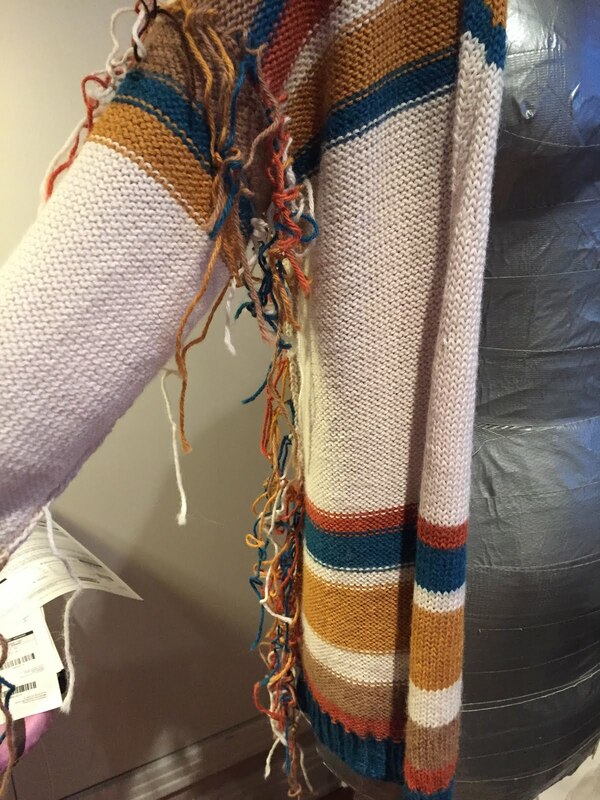 The actual knitting? Dunno - some smallish number of hours. After that I was on a roll. 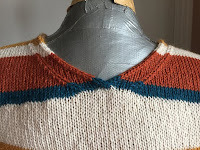 The planning, knitting and seaming of the matching top was done within 2 days. I made the sweaters on my LK-150, a mid-gauge plastic bed machine. I believe these are still being made so can be purchased new, unlike most home knitting machines. While a plastic machine doesn't have the same smooth action as a metal bed machine, it gets the job done. It is very easy to operate and I find it completely unintimidating. The mid-gauge (6.5 mm between needles) means it can handle most hand-knitting yarn weights (from sock yarn to worsted). The disadvantage of this machine is that it doesn't have a ribber, so you must manually reform stitches if you want ribbed bands. This is a little tedious but still a lot faster than knitting them by hand! The yarn is a DK weight and it's 100% Alpaca. Yummy stuff. My son had given me four skeins of the teal colour and a friend had given me four more of the camel colour and 3 of the curry. One day while stash diving I considered how well these looked together, but they needed a main colour (the off-white is called "putty") to mediate between them and another one (rusty red) for punch. 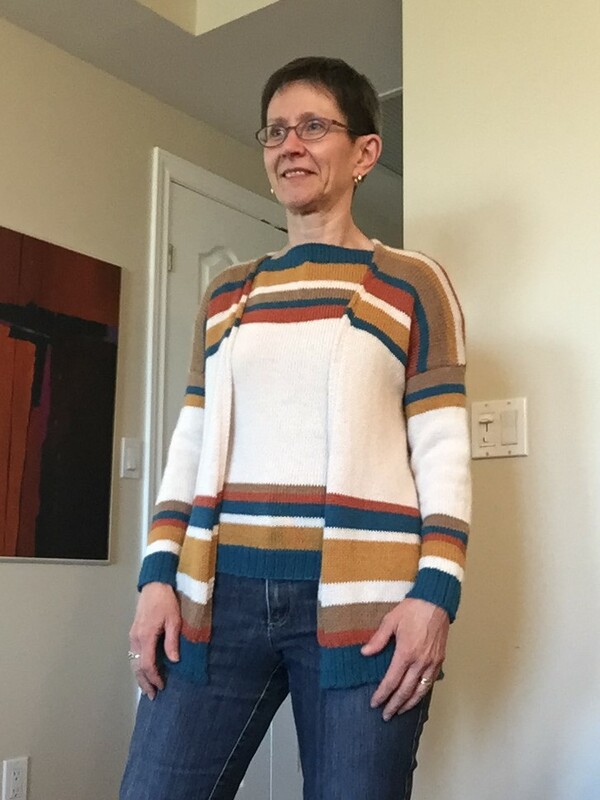 The cardigan is based on a pattern I purchased on Ravelry called Sugarcoat. Other machine knitters had made it and it is a very simple construction. I made it a more complicated task by not using the yarn weight the pattern calls for (sock yarn). 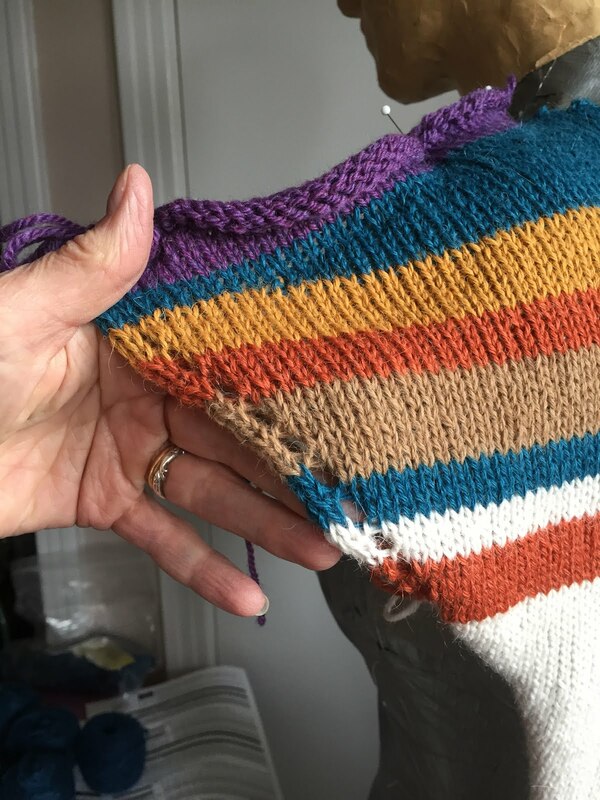 I completely redesigned the stripes for my different gauge and my five colours (the pattern calls for four). I attempted to knit the shape that the pattern would have produced, but my dimensions may not be 100% right because I had to make the sleeves longer than the pattern said. This is the complete opposite of my usual experience. 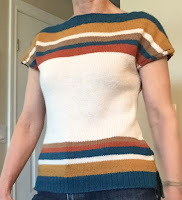 It took me a while to decide how to do the sleeves. As you can see, the pattern says they should be a single colour, but the only colour I had enough of was the camel. I didn't like how a camel sleeve looked. The photo at left is my trial camel sleeve, pinned in (the purple at the top of it is waste yarn). 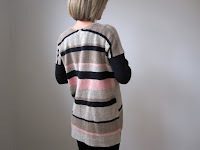 This trial also revealed the need to shorten and narrow the sleeves. You see, machine knitting is so fast I could make 3 sleeves and still finish the sweater in 10 days. 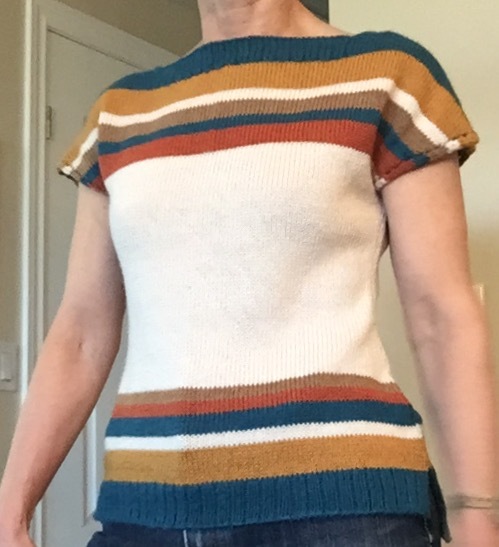 The top is completely my own design although I was inspired by some patterns I faved on Ravelry. 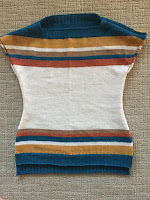 I based its dimensions on another sweater of similar weight. I wanted it to have positive ease but not to be too sloppy. I got it just right! 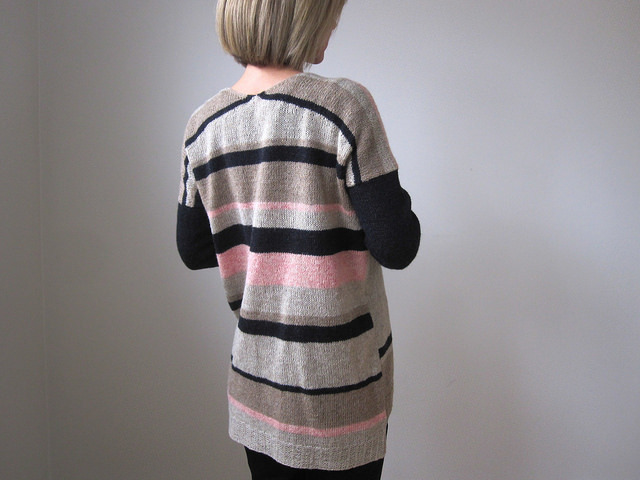 The back of the cardigan and the shoulders of the top are shaped with short rows. It is unbelievably easy to make short rows by machine! You can see the slope created by the short rows quite easily within the striped areas. 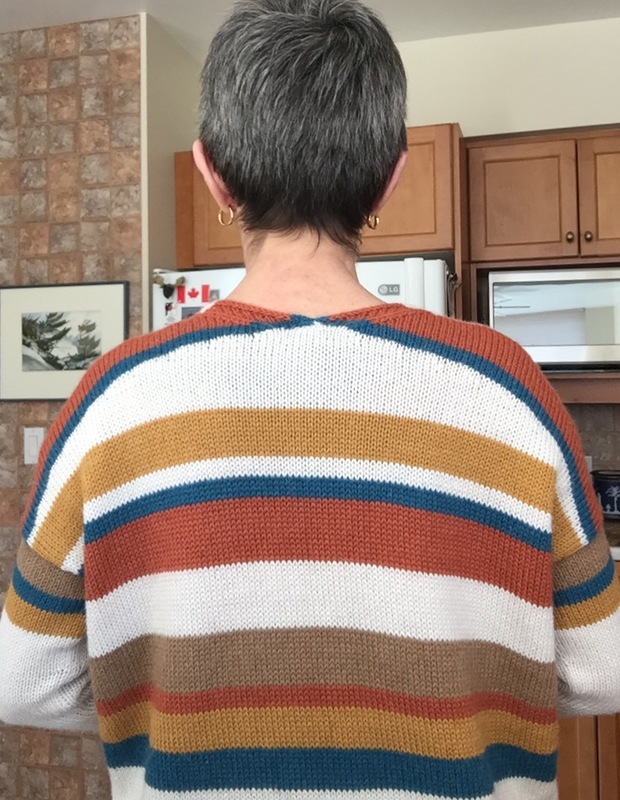 I am very proud of the edgings on both sweaters. 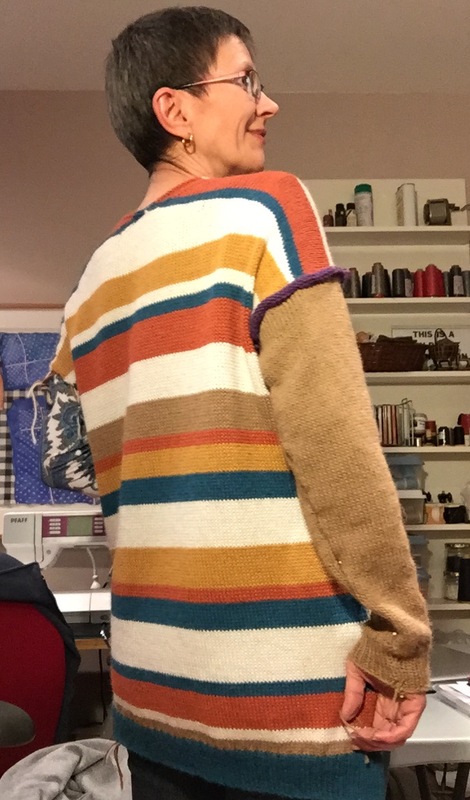 For the cardigan, I invented a very nice flattish edge by augmenting Diana Sullivan's machine knitted decorative no-roll edge. My addition consists of 3 plain stockinette stitches that are outside the diagonal portion of the edging. These stitches roll like crazy, because that's what stockinette does. Therefore they make a nice ropey rounded edge that I think is even nicer looking than the original edging. On the top I made a nice self-finishing edge at the arm openings by moving 3 stitches over and leaving an eyelet. The eyelet opening counteracts the roll that these edges would otherwise have.